Last May, Jack Ü was invited to play the Los Angeles Clippers’ halftime show. 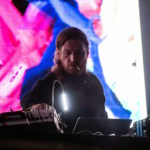 Since then, the pair has managed to have an incredibly busy and buzz-worthy year, both as a supergroup and individually between Skrillex and Diplo respectively. A few months before “Where Are Ü Now” caught fire in the commercial space, however, Jack Ü was fortunate enough to lock down a short slot during the Clippers game to celebrate what would become one of the biggest dance records of the year. With album collaborators Kai and Fly Boi Keno in tow, Skrillex and Diplo do what they do best from the floor of the Staples Center, conducting the good time with CDJs, a few microphones, and of course an obligatory cameo from Dinky the Dog and Katy Perry’s Left Shark. Turning the hardwood court into a dance floor for just a few moments, the two biggest names in dance music offer up a recap of one of their biggest moments of the year.